What is a Heart Murmur? What Can Help My Pet's Heart Murmur? "We had some good news about Puff Daddy on Friday! 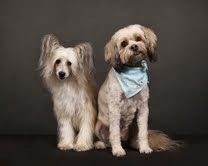 Ever since Puff Daddy was a pup (he is a 7 ½ yr old Chinese Crested Powder Puff now) different vets would say they heard a mild heart murmur (about 2-3 out of scale of 0-6). About two years ago, we started a heart disease protocol that included Amazing Omegas , Purrfect Pet CoQ10 , and Resveratrol for Dogs. This month (January) we went in for Puff Daddy’s rabies vaccination and the vet listened to his heart for quite some time. She looked up amazed. She heard no murmur. She asked me what I was giving him and said to keep it up. Puff Daddy has the energy of a puppy, running at full-speed with dogs 3-4x his size. I am so grateful for all the advice Susan has given me with Puff Daddy and Sheeba before. " Regards, Andrea, Washington D.C.
A heart murmur is an abnormal heart sound, usually heard by listening to the heart with a stethoscope. Your veterinarian will classify the murmur by it's characteristics, including the timing (long or short) and location (where they are the loudest). The specific characteristics of the murmur, along with any symptoms that your pet might be showing, will help your veterinarian to determine what is causing the murmur. The murmur may have been congenital (born with it) or developed from an infection, inflammatory or other disease. Also, some breeds are prone to heart murmurs and heart disease. Many heart murmurs do not require treatment but need to monitored as a heart murmur can be indicative of an underlying heart condition. Depending upon the cause and severity of the murmur, your veterinarian will determine the best course of action. A holistic approach using a healthy diet, supplements and consistent exercise can be very beneficial for dogs and cats with heart murmurs. Feed a high fiber, fresh food (not dry) diet and avoid inflammatory foods such as grains, fatty foods and chemicals. Omega 3 fatty acids are extremely important---use purified fish oil, flaxseed oil and cod liver oil. Supplements can be very beneficial as they reduce inflammation and nourish the heart. Purrfect Pet CoQ10, Amazing Omegas, and Resveratrol for Dogs can give your pet a full and happy life. Just like Puff Daddy!